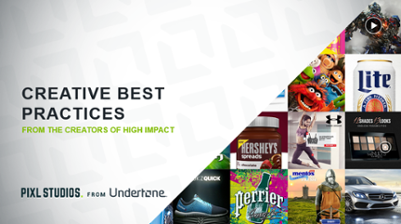 Undertone released Creative Best Practices for High Impact on November 23rd. Jeff Ortegon, our Creative Director, explains Undertone’s high impact focus and why great creative is essential. When I joined Undertone as its first staff graphic designer, I could not have imagined how explosively the company would evolve. I know it sounds like hyperbole, but when I think about it, it truly blows me away. Four years on, we’ve morphed from an ad network scaling standard ad creative into a high impact ad solutions company with a resolute “creative-first” mentality. Our first proprietary ad format, PageGrabber®, launched in 2011 and made us into THE company that helps brands cut through the clutter and truly stand out. While the rest of the industry was cranking out expandable banners, we focused on expanding the state of the art, landing in a place where we could execute & scale distinctive, customized screen takeovers. We made screens fold into paper airplanes and chain saws cut through the page. Really cool stuff! It’s the result of a year spent poring over our high impact analytics and includes some powerful results. Brands, media agencies, and creative agencies can use it to help craft digital strategies for high impact initiatives, execute creative in our proprietary formats, and even connect with specific audiences like Millennials, Moms, and Hispanics. The effectiveness of high impact at creating meaningful connections isn’t a secret. When brands are willing to make creative work, we’re here to maximize its potential with guidance and support. So, check out our best practices and feel free to reach out to me and my team at pixl-studios@undertone.com. Jeff Ortegon is the Creative Director at Undertone, where he leads the PIXL Studios creative team. Obsessed with challenges, he works day-to-day on curating and executing ideas in order to refine and improve them. Jeff has a passion for bringing ideas to life in surprising, innovative and, ultimately, effective ways that move people to feel differently and act accordingly. Prior to joining Undertone, Jeff held several positions at world-class creative agencies including MRY and mcgrarrybowen, where he created on-brand, on-strategy compelling creative for many Fortune 500 brands.